Vehicle is located in the category with the D-series pickups. The Bandito is an SUV version of the D15 pickup. It features a shorter frame, removable rear cap and a rear seat. Also includes a rear mounted spare tire with various optional spare tires and wheels, optional front bucket seats and center console, and optional tinted rear and rear side glass. Its good, but the name.. Bandito; some might get it confused with the gavril bandit, witch is a muscle car ported from rigs of rods. there seems to be a bug with the "alternate two tone". The cap will not change color even if you pick cap 1 or cap 2. 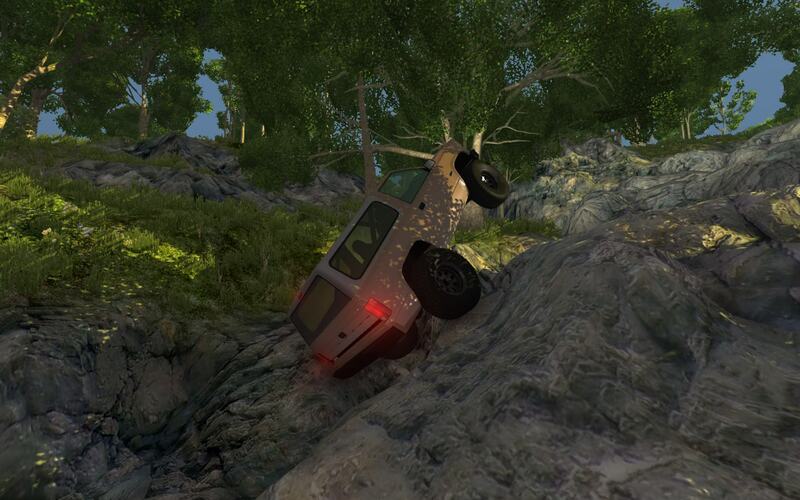 I was driving the yellow off road version and I changed the color to beige, when I made a new spawn point the truck turned yellow by itself and does this whenever I make a new spawn point. Any chance of a panel behind the front seats so I can make a small pickup? im having a problem that when i spawn it it dosnt run there no rev counter either it dosnt matter what engine i put in it. I have an awesome idea. If you made a four door version and put it on an extended frame you could a gavril suburban! Good truck! I love it! when i turn all the way to the right or left this happens. that's nothing wrong with the mod it's steering center angle it happens on real vehicles how about make a legit complaint instead of something that's really not a huge issue how often are you at full lock honestly ? I didn't know vehicles in real life did it because I have never seen a vehicle in real life do it. I love this mod, and if that makes you mad I'm sorry. However, thats not entirely my complaint, it does that at high speeds and if I go over a rock that's somewhat big while it does that I loose steering in that wheel. When I take a tight turn, like a U turn, the wheel hops. I don't know about that happening IRL, but official content does do that in the game. I'm sure those are just official D-series suspensions... which are known to have that behavior already. I have made a "surprise comeback" and a new updated version of the Bandito should be coming very soon. This looks really good. Just from that pic alone I can tell this is going to be a fantastic update. Keep it up, looking forward to that update. Just watched the video! Love the single headlight grille! Also I have loved this mod since day one. Keep up the awesome work.